"Photoshop" redirects here. For other uses, see Photoshop (disambiguation). "Adobe Ps" redirects here. For the vector graphics language, see Adobe PostScript. Adobe Photoshop is a raster graphics editor developed and published by Adobe Inc. for macOS and Windows. It was originally created in 1988 by Thomas and John Knoll. Since then, this software has become the industry standard not only in raster graphics editing, but in digital art as a whole. The software's name has thus become a generic trademark, leading to its usage as a verb (e.g. "to photoshop an image", "photoshopping", and "photoshop contest") although Adobe discourages such use. Photoshop can edit and compose raster images in multiple layers and supports masks, alpha compositing, and several color models including RGB, CMYK, CIELAB, spot color, and duotone. Photoshop uses its own PSD and PSB file formats to support these features. In addition to raster graphics, this software has limited abilities to edit or render text and vector graphics (especially through clipping path for the latter), as well as 3D graphics and video. Its feature set can be expanded by plug-ins; programs developed and distributed independently of Photoshop that run inside it and offer new or enhanced features. Photoshop's naming scheme was initially based on version numbers. However, in October 2002 (following the introduction of Creative Suite branding), each new version of Photoshop was designated with "CS" plus a number; e.g., the eighth major version of Photoshop was Photoshop CS and the ninth was Photoshop CS2. Photoshop CS3 through CS6 were also distributed in two different editions: Standard and Extended. With the introduction of the Creative Cloud branding in June 2013 (and in turn, the change of the "CS" suffix to "CC"), Photoshop's licensing scheme was changed to that of software as a service rental model. Historically, Photoshop was bundled with additional software such as Adobe ImageReady, Adobe Fireworks, Adobe Bridge, Adobe Device Central and Adobe Camera RAW. Alongside Photoshop, Adobe also develops and publishes Photoshop Elements, Photoshop Lightroom, Photoshop Express, Photoshop Fix, Photoshop Sketch and Photoshop Mix. Adobe also plans to launch a full-version of Photoshop for the iPad in 2019. Collectively, they are branded as "The Adobe Photoshop Family". Photoshop was developed in 1987 by brothers Thomas and John Knoll, who sold the distribution license to Adobe Systems Incorporated in 1988. Thomas Knoll, a Ph.D. student at the University of Michigan, began writing a program on his Macintosh Plus to display grayscale images on a monochrome display. This program (at that time called Display) caught the attention of his brother John, an Industrial Light & Magic employee, who recommended that Thomas turn it into a full-fledged image editing program. Thomas took a six-month break from his studies in 1988 to collaborate with his brother on the program. Thomas renamed the program ImagePro, but the name was already taken. Later that year, Thomas renamed his program Photoshop and worked out a short-term deal with scanner manufacturer Barneyscan to distribute copies of the program with a slide scanner; a "total of about 200 copies of Photoshop were shipped" this way. During this time, John traveled to Silicon Valley and gave a demonstration of the program to engineers at Apple and Russell Brown, art director at Adobe. Both showings were successful, and Adobe decided to purchase the license to distribute in September 1988. While John worked on plug-ins in California, Thomas remained in Ann Arbor writing code. Photoshop 1.0 was released on February 19, 1990 for Macintosh exclusively. The Barneyscan version included advanced color editing features that were stripped from the first Adobe shipped version. The handling of color slowly improved with each release from Adobe and Photoshop quickly became the industry standard in digital color editing. At the time Photoshop 1.0 was released, digital retouching on dedicated high-end systems (such as the Scitex) cost around $300 an hour for basic photo retouching. Photoshop files have default file extension as .PSD, which stands for "Photoshop Document." 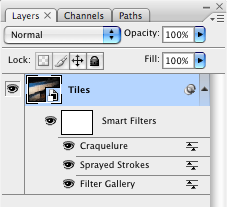 A PSD file stores an image with support for most imaging options available in Photoshop. These include layers with masks, transparency, text, alpha channels and spot colors, clipping paths, and duotone settings. This is in contrast to many other file formats (e.g., .JPG or .GIF) that restrict content to provide streamlined, predictable functionality. A PSD file has a maximum height and width of 30,000 pixels, and a length limit of two gigabytes. Photoshop files sometimes have the file extension .PSB, which stands for "Photoshop Big" (also known as "large document format"). A PSB file extends the PSD file format, increasing the maximum height and width to 300,000 pixels and the length limit to around 4 Exabytes. The dimension limit was apparently chosen arbitrarily by Adobe, not based on computer arithmetic constraints (it is not close to a power of two, as is 30,000) but for ease of software testing. PSD and PSB formats are documented. Because of Photoshop's popularity, PSD files are widely used and supported to some extent by most competing software. The .PSD file format can be exported to and from Adobe's other apps like Adobe Illustrator, Adobe Premiere Pro, and After Effects. Photoshop functionality can be extended by add-on programs called Photoshop plugins (or plug-ins). Adobe creates some plugins, such as Adobe Camera Raw, but third-party companies develop most plugins, according to Adobe's specifications. Some are free and some are commercial software. Most plugins work with only Photoshop or Photoshop-compatible hosts, but a few can also be run as standalone applications. Adobe Camera Raw (also known as ACR and Camera Raw) is a special plugin, supplied free by Adobe, used primarily to read and process raw image files so that the resultant images can be processed by Photoshop. It can also be used from within Adobe Bridge. The "slice" and slice select tools, like the crop tool, are used in isolating parts of images. The slice tool can be used to divide an image into different sections, and these separate parts can be used as pieces of a web page design once HTML and CSS are applied. The slice select tool allows sliced sections of an image to be adjusted and shifted. With the Camera Raw plug-in, raw images can be processed without the use of Adobe Photoshop Lightroom, along with other image file formats such as JPEG, TIFF, or PNG. The plug-in allows users to remove noise without the side-effect of over-sharpening, add grain, and even perform post-crop vignetting. From version 14.1, users can create and edit designs for 3D printing. Artists can add color, adjust the shape or rotate the angles of imported models, or design original 3D models from scratch. Photoshop and derivatives such as Photoshopped (or just Shopped) have become verbs that are sometimes used to refer to images edited by Photoshop, or any image manipulating program. Such derivatives are discouraged by Adobe because, in order to maintain validity and protect the trademark from becoming generic, trademarks must be used as proper nouns. Photoshop's naming scheme was initially based on version numbers. Adobe published thirteen versions (major and minor changes) before the October 2003 introduction of Creative Suite branding. In February 2013 Adobe donated the source code of the 1990 1.0.1 version of Photoshop to the Computer History Museum. Adobe responded to feedback from the professional media industry by implementing non-destructive editing as well as the producing and modifying of 32-Bit High Dynamic Range (HDR) images, which are optimal for 3D rendering and advanced compositing. FireWire Previews could also be viewed on a monitor via a direct export feature. The File Browser was upgraded to Adobe Bridge, which functioned as a hub for productivity, imagery and creativity, providing multi-view file browsing and smooth cross-product integration across Adobe Creative Suite 2 software. Adobe Bridge also provided access to Adobe Stock Photos, a new stock photography service that offered users one-stop shopping across five elite stock image providers to deliver high-quality, royalty-free images for layout and design. CS2 activation servers' shutdown: In January 2013, Adobe Photoshop CS2 (9.0), with some other CS2 products, was released with an official serial number, due to the technical glitch in Adobe's CS2 activation servers (see Creative Suite 1 and 2). CS3 improves on features from previous versions of Photoshop and introduces new tools. One of the most significant is the streamlined interface which allows increased performance, speed, and efficiency. There is also improved support for Camera RAW files which allow users to process images with higher speed and conversion quality. CS3 supports over 150 RAW formats as well as JPEG, TIFF and PDF. Enhancements were made to the Black and White Conversion, Brightness and Contrast Adjustment and Vanishing Point Module tools. The Black and White adjustment option improves control over manual grayscale conversions with a dialog box similar to that of Channel Mixer. There is more control over print options and better management with Adobe Bridge. The Clone Source palette is introduced, adding more options to the clone stamp tool. Other features include the nondestructive Smart Filters, optimizing graphics for mobile devices, Fill Light and Dust Busting tools. Compositing is assisted with Photoshop's new Quick Selection and Refine Edge tools and improved image stitching technology. CS3 and CS3 Extended were released in April 2007 to the United States and Canada. They were also made available through Adobe's online store and Adobe Authorized Resellers. Both CS3 and CS3 Extended are offered as either a stand-alone application or feature of Adobe Creative Suite. Both products are compatible with Intel-based Macs and PowerPCs, supporting Windows XP and Windows Vista. CS3 is the first release of Photoshop that will run natively on Macs with Intel processors: previous versions can only run through the translation layer Rosetta, and will not run at all on Macs running Mac OS X 10.7 or later. CS4 features smoother panning and zooming, allowing faster image editing at a high magnification. The interface is more simplified with its tab-based interface making it cleaner to work with. Photoshop CS4 features a new 3D engine allowing the conversion of gradient maps to 3D objects, adding depth to layers and text, and getting print-quality output with the new ray-tracing rendering engine. It supports common 3D formats; the new Adjustment and Mask Panels; Content-aware scaling (seam carving); Fluid Canvas Rotation and File display options. The Content-aware scaling allows users to intelligently size and scale images, and the Canvas Rotation tool makes it easier to rotate and edit images from any angle. CS4 and CS4 Extended were released on October 15, 2008. They were also made available through Adobe's online store and Adobe Authorized Resellers. Both CS4 and CS4 Extended are offered as either a stand-alone application or feature of Adobe Creative Suite. Both products are compatible with Intel-based Mac OS X and PowerPCs, supporting Windows XP and Windows Vista. CS5 and CS5 Extended were made available through Adobe's online store, Adobe Authorized Resellers and Adobe direct sales. Both CS5 and CS5 Extended are offered as either a stand-alone application or a feature of Adobe Creative Suite 5. Both products are compatible with Intel-based Mac OS X and Windows XP, Windows Vista, and Windows 7. With version 13.1.3, Adobe dropped support for Windows XP (including Windows XP Professional x64 Edition); thus, the last version that works on Windows XP is 13.0.1. Adobe also announced that CS6 will be the last suite sold with perpetual licenses in favor of the new Creative Cloud subscriptions, though they will continue to provide OS compatibility support as well as bug fixes and security updates as necessary. Photoshop CC (14.0) was launched on June 18, 2013. As the next major version after CS6, it is only available as part of a Creative Cloud subscription. Major features in this version include All-new Smart Sharpen, Intelligent Upsampling, and Camera Shake Reduction for reducing blur caused by camera shake. Editable Rounded Rectangles and an update to Adobe Camera Raw (8.0) were also included. Photoshop CC 2018 was released on October 18, 2017. It featured an overhaul to the brush organization system, allowing for more properties (such as color and opacity) to be saved per-brush and for brushes to be categorized in folders and sub-folders. It also added brush stroke smoothing, and over 1000 brushes created by Kyle T. Webster (following Adobe's acquisition of his website, KyleBrush.com). A Curvature Pen tool, similar to the one in Illustrator, was added, allowing for faster creation of Bézier paths. Other additions were Lightroom Photo access, Variable font support, select subject, copy-paste layers, enhanced tooltips, 360 panorama and HEIF support, PNG compression, increased maximum zoom level, algorithm improvements to Face-aware and selection tools, color and luminance range masking, improved image resizing, and performance improvements to file opening, filters, and brush strokes. Beginning with Photoshop CC 2019 (version 20.0), the 32-bit version of Windows is no longer supported. For support with 32-bit drivers and plug-ins, use earlier versions of Photoshop. ^ "Fixed issues in Adobe Photoshop CC". helpx.adobe.com. ^ "Photoshop system requirements". Adobe Inc. Retrieved January 10, 2019. ^ "language versions | Adobe Photoshop CS6". Adobe.com. Retrieved February 29, 2012. ^ a b "PROPER USE OF THE PHOTOSHOP TRADEMARK". ^ Phelan, David (July 13, 2018). "Adobe: Photoshop For iPad Is Coming, Product VP Reveals In Interview". Forbes. Retrieved July 21, 2018. ^ a b Schewe, Jeff (2000). "Thomas & John Knoll". PhotoshopNews. Archived from the original on June 26, 2007. Retrieved June 15, 2007. ^ Story, Derrick (18 February 2000). "From Darkroom to Desktop—How Photoshop Came to Light". Story Photography. Archived from the original on June 26, 2007. Retrieved June 15, 2007. ^ "Photoshop was first sold as Barneyscan XP / Boing Boing". Boingboing.net. Retrieved May 23, 2018. ^ "Photoshop: Born from Two Brothers". CrisherEntertainment.com. February 28, 2013. Retrieved October 15, 2014. ^ "Adobe Photoshop 1.0 Feb. 1990 - 20 Years of Adobe Photoshop". Graphics Software. About.com. Retrieved August 13, 2013. ^ Adobe (July 2010). "Adobe Photoshop File Formats Specification". ^ "Alien Skin Software website". Alien Skin Software, LLC. Retrieved December 17, 2011. ^ "Nik Software website". Nik Software Inc. Retrieved December 17, 2011. ^ "OnOne Software website". onOne Software. Retrieved December 17, 2011. ^ "Topaz Labs website". Topaz Labs, LLC. August 31, 2010. Retrieved December 17, 2011. ^ Harald Heim. "The Plugin Site". Retrieved December 17, 2011. ^ "Auto FX Software website". Auto FX Software. Retrieved December 17, 2011. ^ "AV Bros. website". AV Bros. Retrieved December 17, 2011. ^ "Flaming Pear Software website". Flaming Pear Software. Retrieved December 17, 2011. ^ "Andromeda Software website". Andromeda Software Inc. Retrieved December 17, 2011. ^ "Strata website". Strata. Retrieved December 17, 2011. ^ "Digital camera raw file support". Adobe.com. Archived from the original on December 3, 2010. Retrieved December 4, 2010. ^ a b c d e f "Adobe Photoshop CS3 User Guide" (PDF). Adobe Systems Incorporated. Retrieved March 27, 2012. ^ "Selecting and Displaying Tools". Adobe Systems Incorporated. Retrieved March 27, 2012. ^ "Retouch and repair photos". helpx.adobe.com. ^ "Crop Images". Adobe Systems Incorporated. Retrieved March 27, 2012. ^ Caruso, Ronald D.; Gregory C. Postel. "Image Editing with Adobe Photoshop 6.0". RadioGraphics. Retrieved February 14, 2013. ^ "About sliced web pages". Adobe Systems Incorporated. Retrieved March 27, 2012. ^ a b c "Features | Adobe Photoshop CS5 Extended". Adobe. Retrieved March 28, 2012. ^ "Features | Adobe Photoshop CS5". Adobe. Retrieved March 28, 2012. ^ "The full Photoshop CC is coming to the iPad in 2019". Ars Technica. Retrieved 2018-10-15. ^ Murphy, Samantha. "Adobe Adds 3D Printing Tools to Photoshop". Mashable.com. Retrieved September 15, 2018. ^ Macworld Staff. "Photoshop through the Years". Archived from the original on March 15, 2005. ^ "Adobe Photoshop Source Code". computerhistory.org. Archived from the original on May 7, 2014. ^ Bishop, Bryan (February 14, 2013). "Adobe releases original Photoshop source code for nostalgic developers". Theverge.com. Retrieved October 15, 2013. ^ "Adobe Raises the Digital Imaging Standard with Photoshop CS". Press Release. Adobe. Archived from the original on 13 November 2012. Retrieved 29 March 2012. ^ a b c d e f g "Adobe Pushes the Boundaries of Digital Photography and Imaging with Debut of Photoshop CS2". Press Release. Adobe. Archived from the original on 13 November 2012. Retrieved 29 March 2012. ^ a b c d Adobe. "Adobe Delivers Two Editions of Photoshop CS3". News Releases. Adobe. Archived from the original on 13 November 2012. Retrieved 28 March 2012. ^ West, Angela. "20 Years of Adobe Photoshop". Web Designer Depot. Retrieved March 28, 2012. ^ "Adobe Photoshop CS3 Product overview" (PDF). Adobe official site. 2007. Archived from the original (PDF) on 19 June 2007. Retrieved 17 June 2007. ^ "Adobe Photoshop CS3 Extended - Product overview" (PDF). Adobe Official site. 2007. Archived from the original (PDF) on 28 September 2007. Retrieved 17 June 2007. ^ a b c d e Adobe. "Adobe Introduces Photoshop CS4 and Photoshop CS4 Extended". News Releases. Adobe. Archived from the original on 13 April 2012. Retrieved 29 March 2012. ^ Shankland, Stephen (September 22, 2008). "Adobe uses graphics chip for faster Photoshop CS4". CNET News. CBS Interactive. Retrieved December 17, 2011. ^ "Photoshop CS5 Extended / Features". Adobe Systems. Retrieved December 17, 2011. ^ Haslam, Karen (3 April 2008). "Adobe 64-Bit Photoshop Struggle". PC World. Archived from the original on 7 June 2008. Retrieved 17 December 2011. ^ "Adobe Creative Suite 5 Launch". Adobe Systems Incorporated. Archived from the original on March 26, 2010. Retrieved March 24, 2010. ^ "Niet compatibele browser". Facebook. Retrieved May 29, 2010. ^ Nack, John (May 31, 2011). "Photoshop 12.1 = Photoshop 12.0.4". John Nack on Adobe. Adobe Systems. Adobe Blogs. Retrieved December 17, 2011. ^ a b Adobe. "Adobe Launches Photoshop CS5 and Photoshop CS5 Extended". Press Releases. Adobe. Archived from the original on 13 April 2012. Retrieved 29 March 2012. ^ Adobe. "System Requirements". Tech Specs. Adobe. Retrieved March 29, 2012. ^ "Adobe Photoshop CS6 Beta". Adobe. March 22, 2012. Archived from the original on March 22, 2012. Retrieved March 23, 2012. ^ Adobe. "Photoshop CS6 Beta Now Available on Adobe Labs". Press Releases. Adobe. Retrieved March 29, 2012. ^ a b c "Adobe Photoshop CS6 hands-on preview". Article. The Verge. Retrieved March 29, 2012. ^ Jackie Dove (May 6, 2013). "Adobe scraps Creative Suite software licenses in favor of cloud subscriptions". Macworld. ^ "Creative Cloud now includes Creative Suite Master Collection and Design Premium features". www.adobe.com. Adobe. Retrieved 19 January 2019. ^ "Getting to Know New Features in Photoshop CC". adobe.com. ^ "Introducing Adobe Generator for Photoshop CC". adobe.com. ^ "Introducing New Features in Photoshop CC (14.2)". adobe.com. ^ "Crank it up to 15: Introducing Adobe Photoshop CC 2014". ^ "Adobe Photoshop CC 2014 15.0". Softpedia. SoftNews. Retrieved June 20, 2014. ^ "Photoshop CC 2015 Top 5 New Features". Evermotion.org. ^ "Photoshop CC new features - More library asset support". Adobe.com. Retrieved September 15, 2018. ^ "Get the Goods: Announcing Updates to Photoshop CC, Dimension CC, and More Today | Photoshop Blog by Adobe". Blogs.adobe.com. Retrieved October 24, 2017. ^ "Photoshop Mix". Adobe Systems. Retrieved September 3, 2018.